Welcome to NFL Week 10 folks! Let’s recap what we’re doing here. This is a weekly piece on Daily Fantasy plays for Draft Kings with a focus on GPPs, in particular, the main slate. The articles will indicate who I think will be the chalk plays, who some pivots or contrarian plays are to get off the chalk, and some punt plays that could either save on salary or are just so far below the radar they might be tournament winning plays if all goes well. 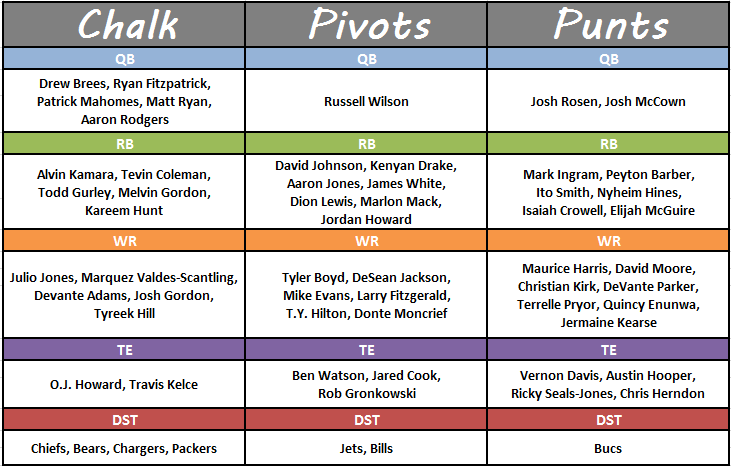 Instead of saying “Player A” is chalk, pivot to “Player B,” there will be a chart showing my data for the match-ups with the chalk/pivots/punts listed after that. In this article, pivots can be a pivot from one player to another player at the same position, from one position to another, or just a way to pivot to the other side of a game that everyone else might be stacking. Now, let’s dig into each game and see what the good chalk is, where to pivot, and if there are any good punts on the slate. Note, in previous weeks I had the games listed in order as they appeared on the Draft Kings slate. Games are listed in order of Vegas implied point totals since the higher scoring games are where we tend to focus our attention first when constructing rosters. 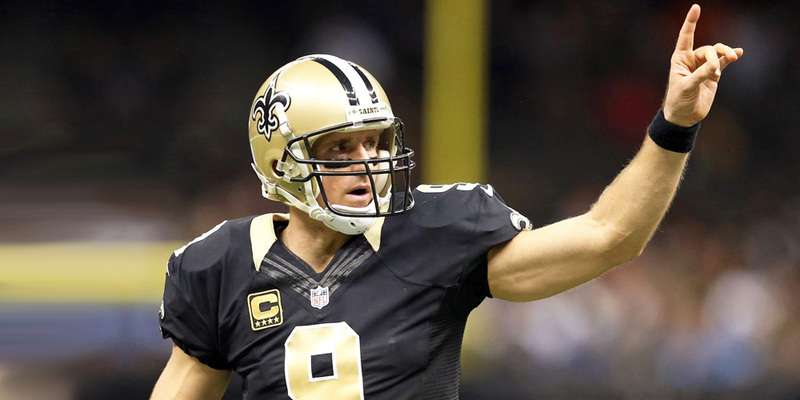 The Saints are coming off what may have been the most entertaining game of the season so far. I loaded up in that game, so perhaps that’s why I was so interested, but the back and forth between the Saints and Rams offense was exciting to watch. Vegas seems to think we’re in for another barn-burner here. 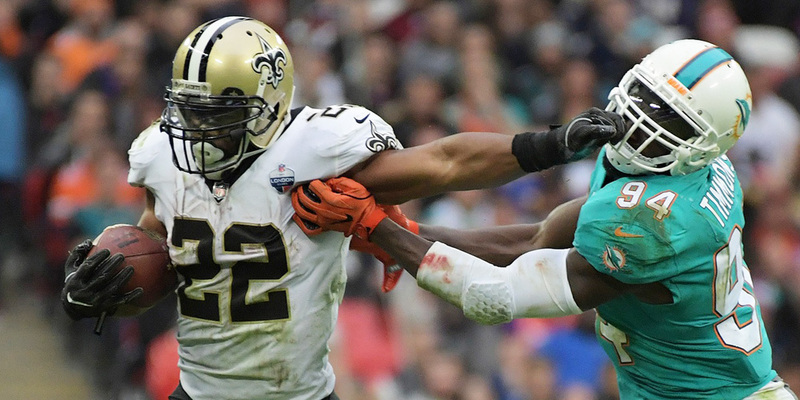 The Saints offense is so heavily concentrated on three players, it makes it easy to know who to use, but because of their salaries, they are not always easy to squeeze them all into your line-up. Drew Brees (6300) will likely be a bit chalky after the game he had last week and the implied point total here, but Brees is not always the same guy when he has to travel outdoors to play road games. Brees has been held to less than 17 points in the three outdoor road games he’s played this year, and the Saints are running the ball more with Ingram back. Brees is more of a fade for me this week than a top priority play. Alvin Kamara ($8700) and Mark Ingram ($4500) will be the main pieces I look to roster on the Saints side this week. The way to attack Cincy is with the running game and with the TE, as they are weak in the middle of the field. Ben Watson ($3400) is a worthy punt option at TE this week because of this. The Bengals are coming off their bye week and will have to try to hang with the Saints without their best player on offense, A.J. Green. The Bengals still have a few other key injuries on both sides of the ball that were not remedied by the week off. The three primary plays from this offense are going to be Andy Dalton ($5800), Joe Mixon ($7700) and Tyler Boyd ($7500). The Saints have the best run defense in the league, which is going to force Andy Dalton to throw more in this one and makes Joe Mixon’s salary seem unreasonable unless Gio Bernard ($4500) is somehow not able to play and he has to handle all passing duties. Even then I don’t think I’d pay up for Mixon this week with so many other stud RBs in a good spot. Tyler Boyd will be interesting because they can get him lined up in the slot quite a bit, where P.J. Williams will be covering. Williams had a better game last week than he has had so far this season, but he’s still the weakest link in the secondary. John Ross ($3900) may be back in this one, but if Boyd is lining up inside, he’s likely going to draw Marshon Lattimore, which I will want no part of. The way this game looks from a match-up perspective makes me wonder how it has the highest total of the week. The Saints should be content to grind out a win on the ground and play defense while the Bengals struggle to find any offense. The Redskins offense is going to have to be on point if they’re going to keep up in this one. Their defense has been torched by two of the other NFC South offenses (Saints/Falcons) already, and the Bucs have the most dynamic passing attack in that division. If the Skins fall behind early, then Adrian Peterson ($5700) will be a non-factor again this week. Chris Thompson would be the ideal weapon for the Skins to utilize in this game, but he has been ruled OUT. Also concerning for the hopes of the Skins is the health of Jordan Reed ($4400), Jamison Crowder ($4200), and the OL. If the Skins can’t pass protect and all of Alex Smith’s ($5300) weapons are hurt, this is going to be a blowout for the Bucs. Smith cannot be trusted to rack up the kind of points other QBs have against the TB defense. It took Smith 46 passes to throw 1 TD and barely clear 300 yards against the Falcons. I’ll mostly fade the Skins this week, but will consider Maurice Harris ($3900) and Vernon Davis ($2800) in my player pool as punt options. Tampa has been vulnerable versus the TE position, but Reed hasn’t been that great so far and Vernon Davis out-targeted/out-produced him last week making it a sketchy play to go with either guy. The Bucs should be able to roll in this one. Their whole offense is in play, with the RBs being at the bottom of the priority list. 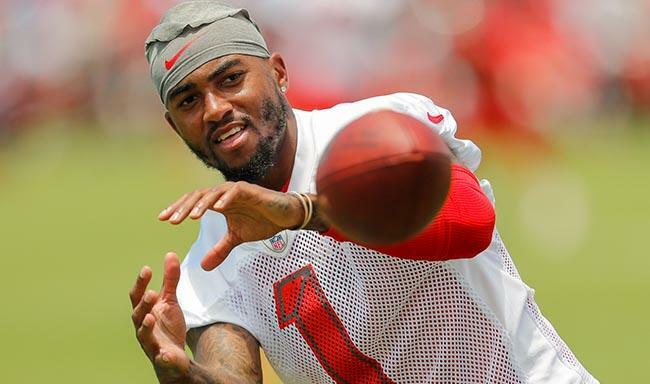 DeSean Jackson ($4900) seems to be a squeaky wheel this week, and it seems like he’s going to get the grease. He was made a captain for this week, indicating the Bucs are trying to placate him, and this is a former employer of his. Cue the revenge game narrative. Jackson and Chris Godwin ($4000) shared a tough match-up last week, but should have an easier time against Washington. Jackson, in particular, started the season off on a ridiculous points per target pace and with Ryan Fitzpatrick ($5900) back in the role of opportunity distributor, I will consider Jackson as one of my high priority plays this week. Mike Evans ($7000) has received an $1100 discount this week for some reason. Sure, he struggled against Carolina last week while playing through a knee injury, but he’s still one of the more targeted WRs in the league and is among the more talented at the position. A Fitz/DJax/Evans stack looks solid this week. At some point, this game could get out of hand and Peyton Barber ($3500) could see a bunch of late carries against a deflated defense, putting him on my punt radar. O.J. Howard ($5300) might be a bit chalky this week, but is also in play here. The Falcons are another squad I’ll be trying to stack with this week. Matt Ryan ($6200) has thrown for over 350 yards in 6 of the last 7 games, and with the Browns defense struggling with injuries that trend should continue. Julio Jones ($8300) finally caught his first TD of the year and will be the chalk sauce this week against the team that has allowed the second most points overall to opposing WR1s in the league (although we have to keep in mind the additional points scored in their 4 overtime games this year). Also likely heading for chalk status will be Tevin Coleman ($5400) after his huge game against the Redskins last week as he will face a team that has allowed 30+ points to an RB1 in 4 games already this year. Calvin Ridley ($5900) got back on the map with a TD and 71 yards last week after having 3 quiet weeks in a row. He’s an option here, but not as high as Coleman or Julio. A couple of punt options in this one are Austin Hooper ($3800) if you’re looking at the TE pool for some savings or Ito Smith ($3700) who sees around 40% of the backfield snaps and has punched in a TD in half of his games this year. So far this year, every team that has faced Atlanta has had a 20+ point RB except for Washington. We know that Atlanta cannot cover RBs and with Kitchens taking over at OC last week we finally saw Duke Johnson’s ($4700) coming out party for 2018. I would expect at least one more good week out of Duke here, as Atlanta struggles with coverage on RBs. Atlanta also struggles against good slot WRs, and have allowed a 20+ point game to the slot in 3 out of their last 4. This is also a boost for Duke, and could help Jarvis Landry ($6200) bust his little two game slump. The salary for Landry this week is pretty attractive, and he will certainly be in my player pool. The third guy I’ll consider on the Browns will be Baker Mayfield ($5400), who’s down in the punt range for pricing but could have a nice game if Duke and Landry pop. This is going to be a tough game for the Seahawks to put up points in. As of Thursday, Chris Carson ($4600) and Doug Baldwin ($5200) haven’t practiced, and Friday’s practice report didn’t show any participation designations, but Carson was listed as questionable. Neither has road grading guard D.J. Fluker. If these guys all go into Sunday’s game with questionable tags you’ll be taking a major risk having them on your roster with only that game left for late swaps. Should Carson sit, Mike Davis ($4300) will play a heavy role and based on the projected volume he’ll see is a solid punt option, and being only $300 less than Carson would give you a pivot if Carson sits. Rashaad Penny ($3500) has yet to see a substantial role in this offense and there have been no indications the Seahawks are looking to increase his role at this time. The always crafty Russell Wilson ($5700) is a reasonable pivot if you’re looking for lower ownership in the Fitzpatrick/Dalton range of QB pricing. It should be noted that Wilson only put up 11.5 points in each game against the Rams last year, so he’s not going to be high on my list this week. With the WRs on this team seeing so little volume, it’s hard to trust any of them. Should Baldwin miss the game, it at least refines our search to Tyler Lockett ($4800) and David Moore ($3900), but neither is anything greater than a dart throw at this point. Moore seems to have the most rapport with Wilson, and has out-targeted the other WRs on the roster for the last two weeks in a row. If you’re throwing a dart here, he’s the way to go. Nick Vannett ($2700) led the team in targets last week and caught a garbage time TD, but don’t be fooled into thinking he’s a reliable play moving forward. The Rams came up short in their attempt to seal their spot atop the NFC last week in New Orleans. This week they will look to get it back on track against a division rival that could be missing their best defensive player this year, Bradely McDougald (questionable). Meanwhile, the Rams are fully healthy and are 10 point home favorites. Todd Gurley ($9400) is match-up proof, and he’s already scored 33 on the Seahawks this year. Gurley had a 46 point game in the second meeting between these teams last year, too. He’s going to be a top priority play for me this week. Seattle is relatively stingy versus the pass so I will look elsewhere for a QB and leave Goff out this week. Robert Woods ($6600) and Cooper Kupp ($6400) both had good games against the Seahawks last time they played, and Goff still only ended up with 14 points. Brandin Cooks ($6700) was injured in that game and didn’t do anything. Woods and Kupp have the better match-ups of the three, so I would choose between those two if using a Rams WR this week. This game could end up at a slow pace with both teams effective in the run game, and Seattle needing to run to try and keep the Rams offense off the field. For that reason, I’m not going to be too high on anyone in this game but Gurley. The match-up chart for this week shows how bad the Raiders defense has been this year. It sets up perfectly for an epic game from Melvin Gordon ($9000). The Raiders are allowing a whopping 40 points per game to RBs at home this year, but have been pretty tough to score on through the air. This is more than likely a derivative of teams not needing to pass against them. For that reason, Gordon is the only Charger I’ll have interest in this week, and he’ll be right there with Gurley, Hunt, and Kamara as one of the top 4 plays of the slate. The only two Raiders that will have any chance at a 20 point game in this will be Jared Cook ($4700) and possibly Jalen Richard ($4800). If you feel you must use a Raider, I probably would stick with Cook, but be warned he did not clear 7 points in either game against the Chargers last season. The Cardinals are 17 point road dogs this week. That’s nuts. The Chiefs are certainly playing out of their minds this year and Arizona is the polar opposite of that, but 17 points? Wow. There are still plays from the Cardinals side I have my eye on. A rejuvenated Larry Fitzgerald ($5400) is definitely on my radar, as is David Johnson ($6800). 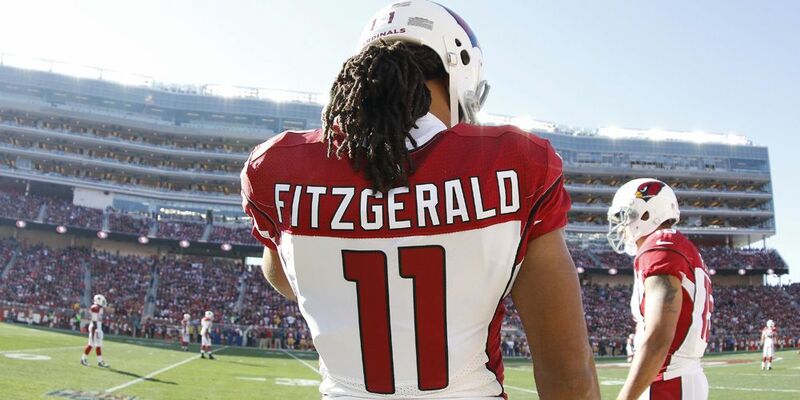 Fitzgerald is coming off a 12 target game, with 3 of those coming in the red zone. Arizona is going to fall behind quickly in this one and will be throwing plenty, giving both Fitz and DJ a nice floor. A couple of ancillary pieces that will be on my punt list are Josh Rosen ($4800) since teams are forced to throw a lot against the Chiefs, and Christian Kirk, since Rosen will have to throw to more than just Fitz and DJ. The Chiefs have been pretty average against the TE position this year which has me considering Ricky Seals-Jones ($3000) as a risky punt option if needing to save cap space at TE. However, Vernon Davis is $200 cheaper and is in a good spot this week. Arizona has yet to allow a QB to really go bananas on them. They are so bad against the run, the QB doesn’t have to. This could be a quiet game for Pat Mahomes ($7200 – QB1) this week because of this trend. Kareem Hunt ($8500) is in another smash spot this week, but with the line being so heavily toward the Chiefs, how long can we expect him to play? Even if he plays three quarters, there will be plenty of opportunity for him to get 25+ points here. There could also be enough scraps left for Spencer Ware ($4000) to grab a 15+ point game. He’d be a risky play, and you would have to believe Vegas has this line right for him to get enough opportunity to reach that total, but it’s a possibility. Sammy Watkins ($5400) is listed as questionable, and if he sits that’s going to concentrate more opportunities to Hunt, Ware, Tyreek Hill ($7300) and Travis Kelce ($7000). Hill is a solid play, but I would be cautious with Kelce. The Cards have seen a similarly talented TE with Kittle twice already this year and held him to 10.7 and 13.3. Of course Kittle doesn’t have Mahomes at QB to help him. Chris Conley ($3200) will probably get some hype as a punt play, but I don’t think he’s going to get that much more involved. Hunt is the prime play here, with Hill and Ware on the radar. The Titans are a decent team playing teams tough this year, and the Pats don’t seem to have it all together yet this season, so this could be a tight match-up between the two. Looking at previous games the Titans have played, and focusing on the more recent games, there doesn’t appear to be a specific spot to target for a 20+ point game from a Patriot this week. But, we don’t always have to take what the defense allows. The three players from the Pats that will be in my player pool for the week are going to be Rob Gronkowski ($5600) – if healthy, James White ($7300), and Josh Gordon ($6000). Gronk is a sketchy play, but his salary has dropped so low he’s hard to ignore. Zach Ertz went for 20+ against TEN back in week 4, but he’s a superior athlete to Gronk at this point in their careers. It’s possible Gronk is the main red zone weapon here, but 20 points is probably more at his ceiling. James White is carrying this team lately. He gets plenty of targets to keep his floor high, and even when Michel is in the line-up, he is still in on some red zone opportunities. His salary is higher than I’d like to pay with Michel likely to be back this week, but it will likely put him into low owned/pivot territory. Josh Gordon is probably my favorite play from the Pats this week. In the last 4 games, he’s averaged 8 targets per game (with a range of 6 to 10), he has 4 red zone opportunities in those games, and is the deep threat this team has been desperate for all year. He’ll face off against former Patriot Malcolm Butler the most and should be able to handle that match-up just fine. Obviously, Butler is going to want to stick it to the Pats this week, but can he? He doesn’t know Gordon, so we’re betting on Gordon’s talent to outshine Butler’s emotion here. Speaking of revenge games, Dion Lewis ($4600) was disappointed the Pats didn’t offer him a contract after last season and will likely have his emotions high in this one. He’s coming off his best game as a Titan and will be the most match-up proof Titan here. Hunt, Cohen, and Hines have all had nice days against the Pats recently as versatile options out of the backfield. The only other high volume option the Titans have is Corey Davis ($4500), but Belichick takes away the opponent’s best receiver, so he’s only a contrarian play this week. Marcus Mariota ($4700) has some appeal as a punt option, but I don’t think we can count on a 20 point game here, so I’m not seriously going to consider him. The Dolphins offense just got shut down in sunny Miami and will now have to head north to the almost frozen tundra of Lambeau Field. I don’t like any of the Dolphin players in this game except for Kenyan Drake ($5100). Drake is averaging 5 targets per game and will likely handle more than that this week if Osweiler struggles to connect with his receivers here. The Packers have allowed 4 WRs to top 19 points over the past 3 weeks, so one of the WRs could have a decent game in this one. DeVante Parker ($4200) is probably the best play for the Phins wide-outs if you need to go there. He had a 9 target game two weeks ago, but crashed back down to 2 targets last week. Aside from the Thursday night game against Houston, Miami has done a good job limiting points to WRs. Still, you have to figure Aaron Rodgers ($6400) is not happy with the results of this season so far and will be playing a little-pissed off here. Miami won’t be able to stop him from doing whatever he wants. Davante Adams ($7800) and Marquez Valdes-Scantling ($5000) are good stacking options to go with Rodgers. MVS will probably be a popular play this week on his own, since he is likely to draw a lot of coverage from whoever Miami finds to play #2 CB this week while Xavien Howard shadows Adams. The Dolphins have been pretty good against #1 TEs, but have allowed Michael Roberts and Jordan Thomas to come out of nowhere and catch 2 TDs against them. 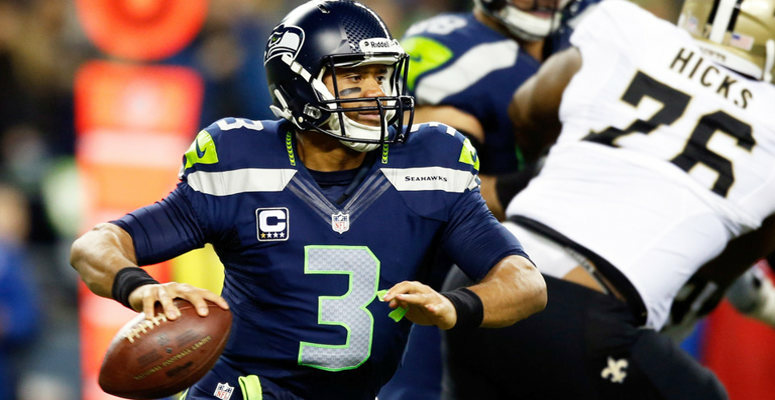 Jimmy Graham ($4600) won’t come out of nowhere, but he will be an option this week. The biggest weakness for the Dolphins is their defense against running backs and pass catching backs. That puts Aaron Jones ($5000) into solid pivot play territory if you can’t get up to the high priced backs in every line-up this week. Leonard Fournette ($6300) will be back for this one, and should slot back into the main RB role with Hyde spelling him for breathers and Yeldon on passing downs. At this point, I’m not willing to play him yet. 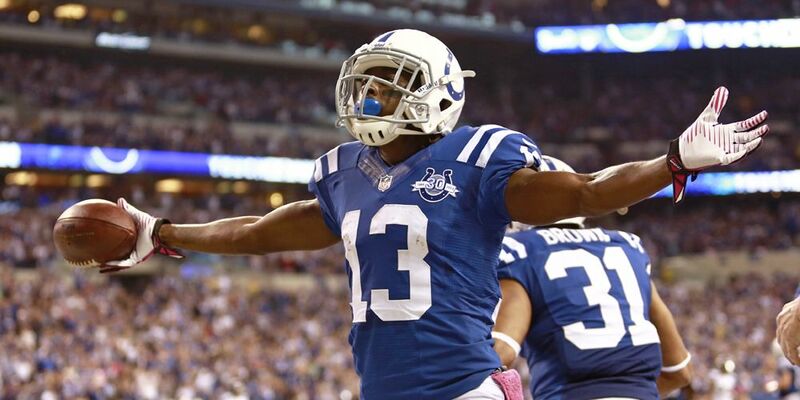 Guys coming back off lengthy injuries tend to worry me, and the Colts have been playing solid defense this year. Fournette was only healthy for one of the meeting against the Colts last year and only scored 16 points. There’s really no one on the Jags that pops out for me. I do have interest in D.J. Chark ($3600) as a punt option. Each of the last three weeks he’s been eating away at Keelan Cole’s snaps and is now up to a 75% share, third best among the WRs. His salary is still low, and he has had a week to think about his end zone drop and come back and make amends for it. Donte Moncrief ($4700) has the revenge game narrative going for him here, and is worth considering even without it. Moncrief leads the team in targets, air yards, and aDot. Both teams are getting healthy coming out of their bye weeks in this one. However, Jacksonville will be down 2 corners. Most notable is A.J. Bouye, but they will also be without Quenton Meeks who would be starting in his place. That is going to free up room for the Colts #2 WR to get loose. The problem is, no one has been reliable in that role this year. Ryan Grant ($3600) is the guy normally slated to line up at that spot, but his best game this year was 13.9 points in week one. Chester Rogers ($3700) is the other candidate to line up there, but he normally lines up in the slot and his biggest games came with T.Y. Hilton ($5700) out of the line-up. The question here really becomes how much do the Colts move Hilton inside to avoid Jalen Ramsey and try to get him going. Hilton has been back from injury for two weeks, but you’d never notice from his box scores. In my opinion, Hilton at $5700 is the best play here, as I think they will scheme him away from Ramsey enough to get him up around 15 to 20 points. If they do move Hilton to the inside, then either Grant or Rogers is going to get stuck with Ramsey, so both would be an avoid. Jack Doyle ($4300) came back from injury last week and immediately made Eric Ebron ($3500) a TD dependent play, out-snapping him 57 to 17 and out-targeting him 7 to 3. However, both got 1 red zone target each. Also concerning for Ebron was he was 4th in snaps for the 4 Colts TEs that played last week. The good news for Ebron is two of those guys will be out this week, so he should get back a larger share of snaps and opportunities this week. The Jags have been pretty tough on TEs though, so both are going to be hard to play. Gronk (3.5 points), Kelce (15.0), and Ertz (12.6) have all been held below what we’d expect from them versus this Jags defense. The best position to target against the Jags has been RB, but even that gets tight. Zeke scored 18, Miller scored 20, and Smallwood scored 14.6 against the Jags in the last 3 weeks. With Marlon Mack ($6000) now handling the lion’s share of snaps and touches, he’s the best guy to target in this backfield. The Colts saw the same defensive weakness in Oakland last week and exploited them using both Mack and Nyheim Hines ($3700), who saw 5 and 6 red zone touches, respectively. If you need a cheap RB punt this week, Hines has some risk/reward built in here. Matt Stafford ($5000) got destroyed last week, and he will be without one of his starting guards again this week. Even worse is Khalil Mack is set to be back for the Bears. The Lions are a full fade for me this week, but if you wanted to use any of them, I would recommend Marvin Jones ($5500). He is the most reliable for targets. The Bears DST ($3600) is reasonably priced and should be fairly high owned after their results and the results of what happened to Stafford last week. The Lions have struggled against the run, but did try to solve that problem by bringing in Snacks Harrison at the DT position. However, Dalvin Cook and Lat Murray were still able to combine for 120 yards on the ground against them. Jordan Howard ($4700) has scored 4 TDs in the last 3 games, but has yet to eclipse the 100-yard mark. If the Bears defense is shutting down the Lions, then there could be a lot of clock-killing carries as this game wears on, and a few red zone opportunities for Howard to either reach the 100-yard mark, or allow him to find a path to 20+ points this week. Tarik Cohen ($5500) is also on my radar here since the Lions lack any skill at the LB position. Cohen should be able to exploit the short areas of the field and get loose for some big gains. The Lions are tied with the Raiders for most 40+ yard gains by a run, which will be good news for these RBs. Should the Bears decide to throw a little, they will not have to worry about Darius Slay covering anyone this week, since he has been ruled out. That will free up more space for Allen Robinson ($5000) and Taylor Gabriel ($4900) on the outside. Both of these guys will be low owned this week and either makes for a good pivot option. Cripple fight! The Bills can’t keep a QB healthy this year, and can’t get Shady McCoy ($4500) any room to run. Since the theme of this week seems to have a re-occurring revenge game narrative, let’s go there with Terrelle Pryor ($3000). He’s facing the team he feels didn’t utilize him correctly. The Bills allowed Fat Kelvin to exact his revenge on Carolina in preseason, so why not let Pryor? The Bills lined him up all over the place in his first week with the team and he had an 82% snap share, but only saw 5 targets and 1 carry. That should ramp up here, making him a viable punt option this week. Since he’ll move all over the place, it’s unclear if he’ll face any one of the Jets corners frequently. The Jets do have all there corners back healthy for this one, too, so there is that. The Jets will be starting their backup QB Josh McCown ($4300) this week. McCown is an interesting punt option due to the salary being so low and he’s been on the team long enough and in the league long enough to know how to handle the situation. He’ll be missing the WR I was most excited about rostering this week as a punt option with Robby Anderson getting the doubtful tag. However, he’ll still have Quincy Enunwa ($3700), Jermaine Kearse ($3500) and Chris Herndon ($3100) available. Every single one of these guys are on my list as a salary saving punt option this week, and pretty much in the same order as listed. As ugly as this game looks on paper, it will be the source of salary savings to help get those stud RBs onto your rosters this week. If you’re going with the opposite approach and paying up at WR, then you have two RB options on the Jets to punt with. Isaiah Crowell ($4200) is game-script dependent, and will hit value if this game plays out as Vegas predicts. He’ll get a bunch of carries and probably a TD or two. Elijah McGuire ($3400) will see an increased role if the game stays close or the Bills somehow take a lead. McGuire out-snapped Powell 36 to 23 on the road last week in a close game, and had 12 opportunities to touch the football (7 carries & 5 targets). Crowell has 15 opportunities (13 carries & 2 targets), and is probably the safer way to punt here. This game could be so ugly you might just want to roster either defense and leave the rest alone. There are a lot of high-end RBs in good spots this week. It’s going to be hard to narrow it down to 2 or 3 if you’re only doing 1 or 2 line-ups. There are plenty of values at WR to make a LU with three horse-backs on it, but you’re also looking for value at QB and TE and/or DST. If you’re able to play multiple line-ups then lock in your RB core and build rosters around each combination of that core. Good luck this week, and thanks for reading!